Yesterday’s excerpt dealt with the effect my older daughter Valerie’s depression and disappearance had on my imagination. Today’s excerpt, which begins on page 101, describes the effect that catastrophic event had on my story creation. It spawned an entire novel, The House of Dead Maids, set in a fictional world very important to me during my own bout of depression at the age of nine. The House of Dead Maids was peopled with characters both old and new, old characters who had mattered to me during my depression in childhood and new characters who were helping me come to terms with life after my daughter’s disappearance. The House of Dead Maids also encouraged me to explore the relationship of that world’s author, Emily Brontë, to her own fictional world. Emily Brontë is perhaps the least judgmental of all Victorian authors. It’s a trait that still drives mentally healthy, morally strong readers crazy today. Those readers want judgment. They want the bad characters in Wuthering Heights to get punished. But Emily isn’t interested in that. Perhaps Emily’s own history of living with a “bad” and mentally ill family member explains why she didn’t feel the need to judge her characters as her Victorian neighbors surely judged her family. Certainly Emily’s ability to cope with the Brontës’ grief and shame was the reason I felt drawn to her at that point in my life. Ultimately, my novel became a conversation with Emily—a conversation she would have understood. Emily and her sister Anne had had similar conversations in fictional form throughout their lives as they worked together to construct their shared fictional world, Gondal. Indeed, one might suspect that Anne wrote her shocking novel, The Tenant of Wildfell Hall, as a fictional answer to some of the themes of Wuthering Heights. Anne’s novel, while equally brutal in many respects, gave readers the clear moral judgment they wanted and the chance at moral redemption they found lacking in Emily’s novel. It’s important to note that by this time, I knew that my daughter was safe. Valerie wasn’t communicating with us or her doctors, but we had found out that she was with good people. If I hadn’t known this, I couldn’t possibly have written fiction—or done much of anything else, for that matter. Time passed. Our house was quiet. There was no reason to fight anymore. Elena spent her time at school or at the hospital, and Joe worked his long days at the office. Once again, I wandered through silent rooms, as I had after the girls had left for boarding school. Once again, I had no job. I had no projects. But I was different now. The piece of my soul that Valerie had taken with her when she left—that part of me stayed lost. My isolation was absolute. Why would I want that to change? What could I say to the people I knew? That was the question I lived with every second. It pulsed through my arteries with every beat of my heart. I breathed and ate and slept that question. I couldn’t possibly bear to hear it spoken out loud. So I let the walls of my house define me. I had no intention of reaching out for a life beyond their limits. I was content to remain alone. But when it comes to the imagination I have, I am never alone. As I sat and drank my tea at the dining room table, I found an old friend sitting beside me. She had an oval face like Valerie’s, and dark hazel eyes, and like me, she, too, had felt no desire to leave home. She had long brown hair put up in a bun and terrible handwriting like mine, and more than anyone else, she understood what I was going through. This hazel-eyed woman was the Victorian writer Emily Brontë, the creator of my childhood playmate, Heathcliff. She died of tuberculosis in 1848. But when we are truly great, we never really die. Delicate kitty Tor was welcome in her shadowy company. Emily’s own animals had filled her house and occupied the first place in her heart. She had once told a classroom full of her pupils that she preferred the school dog to any of them. Nor were my spiritual bruises over the loss of my daughter any obstacle between me and Emily’s presence. “Well, some may hate, and some may scorn,” Emily told me with casual grace, and it was obvious that she couldn’t care less if they did. Her own beloved, talented brother had drunk himself to death right in the same house with her, but she was strong and independent, a remarkable woman who had achieved remarkable things, and my imagination brought her to me now as a kind of sister. I had looked up to Emily Brontë since I was a little girl, when my mother had first told me stories about her. I remembered hearing, breathless with wonder, how she saved a child from a rabid dog—and then walked home and cauterized the bite she’d received with a red-hot poker. The world as Emily knew it was a harsh, brutal place, but she had faced that world without flinching. And her antihero, Heathcliff, true child of his powerful author mother, had helped me face my freakish childhood without flinching. Now, vulnerable and lonely, as I tried to pull myself together again, I reread her classic novel, Wuthering Heights, and I found its barren, windswept world a safe place to be. No one there looked down on my crippled spirit. No one there was whole. Deep in the nighttime, when not a spark gleamed indoors, nor a star without, the dead maid stood by my bedside again and summoned me from sleep. She shook me as if to rouse me and take me with her, those chilly fingers sliding down my arm. And that bleak, savage story healed me. It sounds strange to say that something so grim and brutal could help heal the damage I felt, but it happened because my characters themselves refused to give up hope. Even in that grim world, they found compassion in unexpected places, and those moments of compassion shone out in the darkness there like lighthouse beams. Step by step, they guided me back to serenity and forgiveness. Text copyright 2015 by Clare B. Dunkle; text courtesy of Chronicle Books. 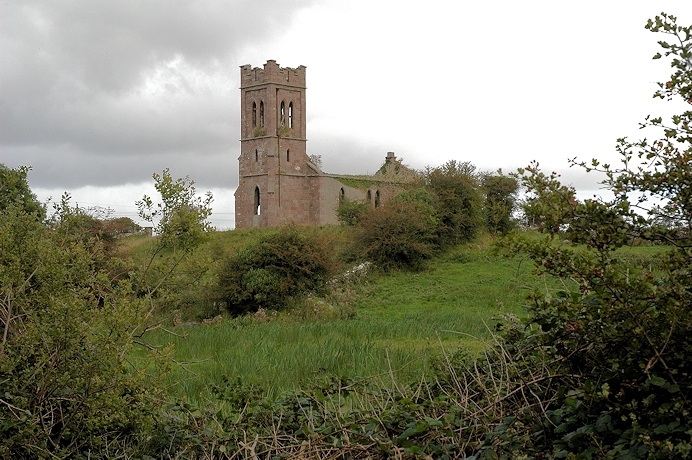 Photo of a church ruin in Ireland copyright 2004 by Joseph Dunkle. To read my latest blog posts, please click on the “Green and Pleasant Land” logo at the top of this page. This entry was posted in Books and reading, Creativity, Hope and Other Luxuries, Jungian archetypes, Writing craft. Bookmark the permalink.